This recipe is adapted from Mary Bell's Dehydrator cookbook, which is my “go to” book for all things dehydrated. I prefer to use organic spices whenever possible, as they are not irradiated or sporting excess chemicals. The flavor and aroma generally knocks the socks off the average grocery store spices, too. Using homegrown pumpkin and you-pick or homegrown apples for applesauce, bulk dried coconut and honey helps make this treat budget friendly. Mix all ingredients together. Adjust spices if needed, but keep in mind that drying will intensify the flavors. You may want to try a test batch or half batch before adjusting. I made a half batch the first time through. When I made it the next time, I made a double batch. Spread mixture on well oiled fruit leather sheets in dehydrator (I oil mine with coconut oil), or drop by the tablespoon to make “cookies”. If doing “cookies” leave about 1/2″ to 1″ between rounds. I spread mine in sheets because it was faster and easier, but if you liked the cookie idea you could use a pastry bag to make the cookies in a hurry. Just load your mix in and squirt away. I like to use my pastry bag for making cream puffs, too. One half batch nearly filled two fruit roll sheets in my American Harvest snackmaster dehydrator. A double batch filled four sheets in the Excalibur dehydrator. I made two sheets plain, and sprinkled chopped cranberries over the other two sheets. I arranged the cranberries in lines on one sheet and just sprinkled them over the other, but once they were finished, cut and rolled, they didn't look that different. Do make sure to finely chopped your raisins or cranberries, otherwise you'll end up with sticky spots. Dry 8 to 24 hours at around 135°F (57°C). I loaded mine at night and unloaded it the next morning. As you can see, the mixture will darken as it dries. Cut in squares or strips. Roll up if you like. The coconut will make this recipe less sticky than some other fruit leathers. Stack sheets of fruit or vegetable leathers on top of each other. If desired, and this is optional, you can sprinkle the finished sheets with cornstarch or arrowroot to prevent them from sticking together. Roll up, wrap securely in plastic wrap, and put them in an airtight container. I've never dusted mine with anything, and I typically cut them into strips before storing to encourage munching of only small amounts at one time. After all, even though they're all natural, it's still a fair amount of concentrated sugars. I store mine in plastic bags or glass jars, in the cupboard or fridge depending on the expected length of storage time (and how much room I have in my fridge). Refrigeration will extend shelf life, but properly dried fruit sealed in airtight containers should keep for months as is. 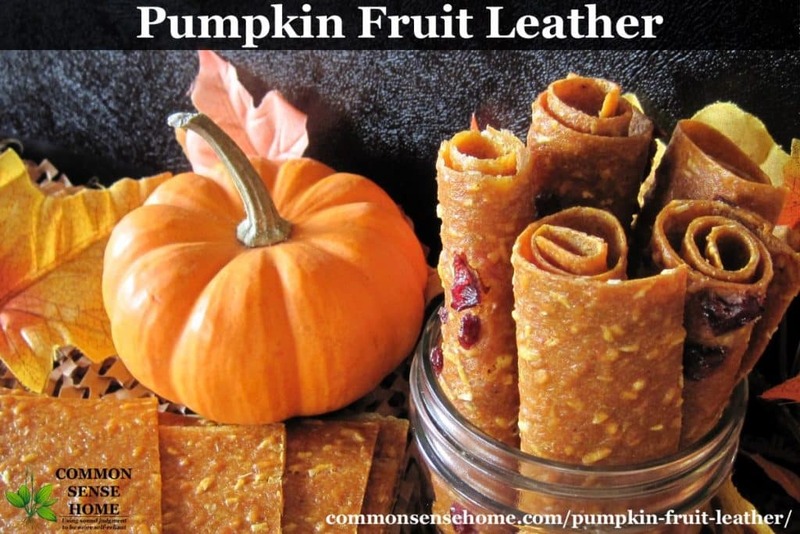 =>Click here to get more fruit leather recipes. Note: Winter squash is high in vitamin A, vitamin C, dietary fiber, manganese, vitamin B6, potassium, vitamin K, folate, tryptophan, copper, riboflavin, omega 3 fatty acids and magnesium. Now you have even more reasons to give this treat a try! I'm so glad I tried out this recipe – it's a keeper! 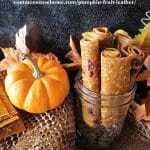 This pumpkin leather makes a great snack food or lunch box stuffer. You can also use it to add a little extra nutrition to a hot breakfast by slipping some into your oatmeal or other hot cereal. If you don't like coconut or dried cranberries or raisins, just leave them out. 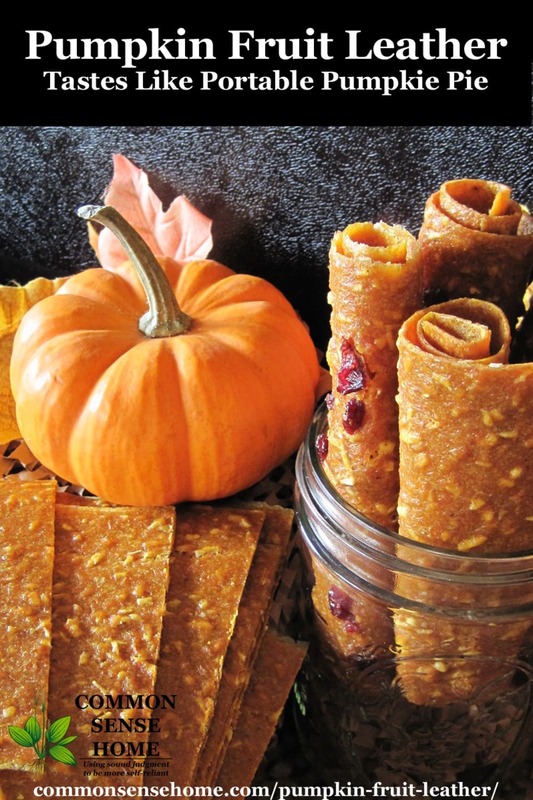 This dried pumpkin leather is a tasty, easy to make snack that tastes like pumpkin pie. Nutritious, portable, and doubles as a way to store extra pumpkin. Mix all ingredients together, except cranberries or raisins. Spread mixture on well oiled fruit leather sheets in dehydrator (I oil mine with coconut oil), or drop by the tablespoon to make “cookies”. If doing “cookies” leave about 1/2″ to 1″ between rounds. 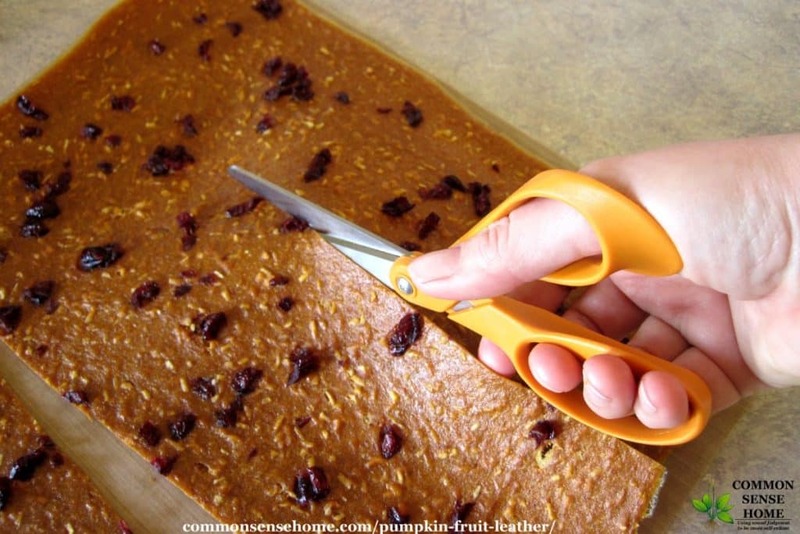 Sprinkle cranberries or raisins on top of pumpkin mix, if desired. Dry 8 to 24 hours at around 135°F (57°C). Cut in squares or strips. Roll up if you like. Refrigeration will extend shelf life, but properly dried fruit sealed in airtight containers should keep for months without refrigeration. 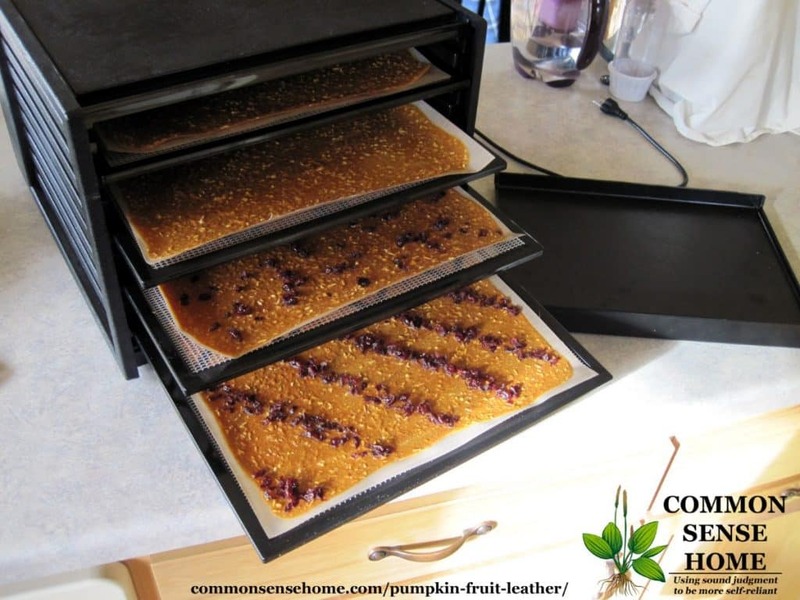 Note: If you're purchasing a dehydrator such as the Excalibur or Snackmaster, you should also order the fruit leather sheets. It looks like the current Snackmaster comes with one sheet, which won't get you very far if you are drying a large amount of something like applesauce or tomato puree. The Excalibur does not include fruit leather sheets by default. For more tips on dehydrating, including how to safely use your oven for dehydrating, see Home Food Drying – 6 Things You Need to Know to Dehydrate Food at Home. I made with parchment paper and it seemed to work ok. Except they cracked all over. Maybe I spread too thinly? It's my first attempt at leathers. I wish I could make these every day just for the wonderful aroma throughout the house! Try spreading it a little thinner or drying it for a shorter time, or both. That should give a more flexible leather. Considering this is made with milk I am having a hard time believing it would last months stored in a jar or even a fridge, without freezing. Canned milk, which is shelf stable, not fresh milk. I do normally keep it in the fridge. It’s lasted about 6 weeks with no fur or other signs of spoilage before being eaten. The various spices have a preservative effect in addition to adding flavor. This is a great idea. Please link up to my new Fall Harvest Blog Hop. That looks like the same dehydrator as I have, but I don't have an instruction manual for it. Do you happen to have a spare, or know where I can find one? I got the dehydrator as a hand-me-down and am a little afraid to do much with it since I have no clue what I'm doing or where to find out how to do anything without destroying the machine or blowing up the house or something. There's really nothing to using it – just set it to the correct temp for whatever you're drying and let it dry. I've been using mine for years and have yet to blow anything up. 🙂 Most of the time I let it run overnight. What is the purpose of the coconut milk? Could you use something else? I have an abundance of hubbard squash I’m going to try with this. The coconut milk adds flavor and modifies the texture a little. You could also use evaporated milk, or try skipping it all together and seeing how it works. This sounds seriously yummy!!! I have some extra crookneck that I have to use up and it’s apple season (almost) here! Am really excited about trying this out! After Thanksgiving! We harvested so many pie pumpkins and I have canned a bunch and was wondering if I was going to have to through the pumpkin out after collecting the seeds (my husband nuts for taco flavored roasted pumpkin seeds) Now I am thinking of this plus I have a recipe for pumpkin butter found on the web and am going to try that. If I use parchment paper do I need ‘oil’ it first? If you’re not concerned about reusing the parchment, you can probably skip lubing. Maybe try a single batch first, and see if you like the results? Just a quick update. Made my first batch of pumpkin leather over night. It turned out fantastic! I chose to do pumpkin butter recipe that I got from mysheglows.com. Neat site great recipe. I got two and a half sheets out of about 6 cups of mix. This is great, I have some pumpkin about to expire, and this will give me a few more months, perhaps, not, once the grandkids get hold of it! I did this but with a couple of changes. 1) I used Yams 2) I used pureed Pineapple. No raisins however, I might try some cut up dates. Yummy ! If I do this with canned pumpkin, do I have to cook the pumpkin first? If so…how? Canned pumpkin is cooked during the canning process. Hi Laurie, can you dry it in the oven ? If you can get your oven down to around 140, it should work. Prop the door open to keep air circulating during the drying time. 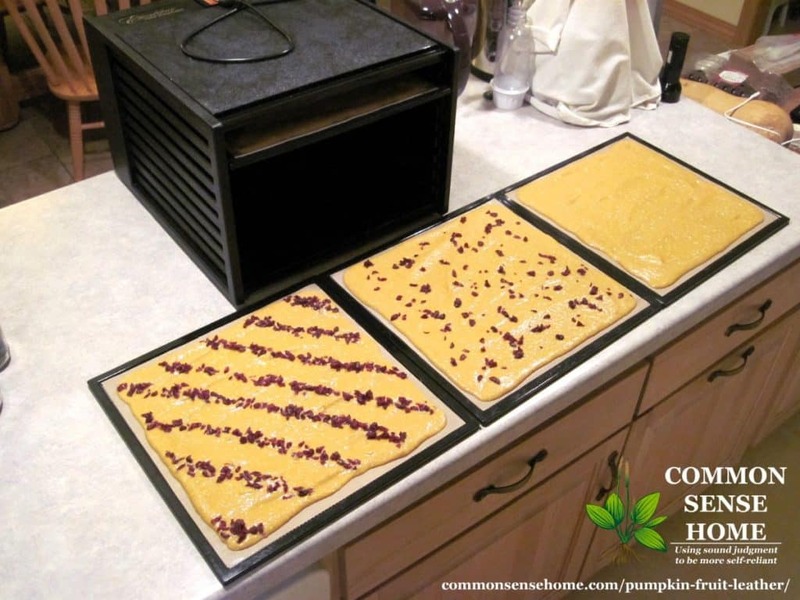 See the post on home food drying for more detailed instructions on using an oven to dehydrate food. Cannot even begin to express my excitement over this recipe. Got a dehydrator this year and have been looking for interesting recipes!!! This will make some Christmas treats for my nieces and nephew. Thank you!!!!! If you can set your oven temp low enough, that’s one option. Some people also dry with just the pilot light. Just wondering if anyone has made this in the oven; if so how did it turn out? I don’t have a dehydrator but would love to make this recipe. I have a two year old Jen Air range and it does have a drying cycle, imagine that! I have only dried pears and hot peppers on parchment paper. Worked well. It has three racks so I should be able to do a fair amount. Sounds promising. 🙂 I have yet to figure out a way to get my gas range to run at a low enough temp, but I now have two dehydrators so I’m pretty well covered. Has anyone tried omitting the applesauce? I have an abundance of musquee de provence pumpkins & they’re sweet enough by themselves…hmmm. The applesauce isn’t just for the sweetness, it’s for the pectin, which makes the snacks flexible instead of brittle. Just made my first batch – awesome!!! I did use half again more dried cranberries than called for, and may even use more next time (I love dried cranberries…), and I just mixed them in with the rest of the ingredients. A single recipe filled two trays in my Excalibur, and it took 10 hours (our indoor air is pretty dry in winter so I’m sure that affects drying time). I reead through your notes, the recipe and now I have another questikn. I am looking to make pumpkin leather strips for our dog. I would rather purchase, but can’t find. Do you think, with your experience, I could tackle the product with just plain canned pumpkin spread on the leather sheets? You could dry just plain pumpkin, but it would make a better “leather” if you mixed it half and half with applesauce. The applesauce will make it pliable instead of brittle. Hi, this has nothing to do with this delicious looking recipe. I have a friend who is sure her turkeys are eating the chicken eggs and even chickens. Any advice? Know of any place of turkey wisdom? Thanks. Unfortunately, once poultry has developed bad habits, they are incredibly difficult to break, and the problem birds are typically culled. If she could house them separately, that would take care of the bad behavior temporarily, but there’s not any easy way to “cure” it. Birds are omnivores. Usually they stick to things like bugs, frogs, snakes… but sometimes, they don’t. I’ve kept my dehydrator full for the last couple of weekends with this. I’ve tried many different things, including pomegranates, but I always keep the coconut milk, apples and pumpkin (actually so many different varieties of winter squash because I have an abundance that grew and have bonuses of volunteers). I always use the seeds and have gone back and forth between cooking the squash and not. Just be aware of the seeds and use them raw in your blender, because they have a lot of zinc in them and it’s a great addition nutritionally. I like pepitas separately, but haven’t tried them in something like this. Don’t you find that they add a slightly gritty texture? I want to make fruit leathers etc. but most leathers are made with applesauce. Is there any way to make them without using apples, or any other fruits from the ‘high FODMAP’s’ group? My girls were diagnosed with a fructose absorption issue. I’m not sure which fruits are in the high FODMAP group – but – it’s the pectin in the applesauce that adds elasticity to the finished product, so I’m wondering if it would be “safe” to use the isolated pectin without the rest of the sauce, like NOW Foods, APPLE FIBER POWDER 12 OZ ? Without the pectin, the leather will be brittle. I would like to use your picture and put a link back to this website, if I may. Yes, it’s fine to use a single image with linkback. Thank you for asking. is the milk even necessary, i have plenty of applesauce but don’t understand the milk, i have coconut and cranberries (dried) but milk? The milk adds richness, giving it more of a pie flavor. You can try it without if you like. I’m so excited to try these! I’m new to a Paleo diet and am wondering how sweet these are? Getting to the point, can I reduce or leave out the honey? I’m happy with a hint of sweetness as long as the texture and flavor comes out right. Thanks! You could leave out the honey and I believe they would still work. I’d suggest mixing it up without the honey, tasting, then deciding if you want to add some honey or leave it out. How can I be sure my leather is dry “enough”? I spent a couple of days last fall turning an enormous heirloom pumpkin into pumpkin pie leather. After roasting I pureed the flesh and drained off as much of the moisture as I could before mixing in a good amount of sucanat and spices, as well as Universal Pectin to help prevent cracking. After hours upon hours of drying (don’t recall the exact length of time) it was, as far as I could tell (and according to the instruction book), as dry as it was going to get. I cut the leather into large pieces with scissors, along with the parchment paper that lined the tray, and rolled the pieces up in the parchment before stuffing them into three quart-size mason jars for storage at room temperature. Recently I thought I’d get some out to take on our weekend camping trip, only to find that all of it had molded. As I’m more inclined to salvage than toss I was hoping to wash off the mold and re-dry the leather in a low oven; but it’s too digested (ick) by this point to be saved. As I recall this represented only half the pumpkin (the rest having been frozen as puree) but I still hate that so much (including my time) was wasted. Any tips for future reference? Most of the time when I prep “pumpkin” for cooking, I’ll actually use squash, because it has a lower moisture content. I don’t know what variety you used, so I can’t speak directly to your starting moisture levels. When I dry, more often than not, I dry overnight, sometimes longer. Every single dehydrator book I’ve used seems to woefully underestimate drying times. I generally allow 8-10 hours, sometimes more. When dehydrated food is properly dry, it should be really dry – no tacky spots. If it’s tacky, keep it in the fridge or freezer and use it sooner rather than later. You may have run into trouble with the pectin. Pectin tends to hold water. Too much, and it can make it very difficult to dry your food properly. A friend of mine tried to dry some commercial fruit spread. She ran and ran the dehydrator, but it always stayed tacky. The problem – pectin. When you add applesauce, it’s enough pectin to keep the fruit leather flexible, but not so much that it doesn’t dry properly – thus the pumpkin leather recipe in the post. I don’t advise trying to wash off mold. It will send filaments below the surface that you can’t see. As for checking moisture levels – there’s a device called a hygrolid that screws onto a wide mouth mason jar. It’s a hygrometer that reads the relative humidity inside the jar. Simpler rule of thumb – place food in jar. Put lid on snugly. Let sit overnight. In the morning, if there is condensation on the lid, it’s not dry enough. If still not sure, store in freezer or refrigerator. Once you know your food is dry enough, vacuum sealing it in storage jars will maximize storage life. Could using Quince solve the pectin problem? Quince is high in pectin, so it could probably be substituted for the applesauce. I’m not sure about the flavor profile and texture, as I have never eaten or cooked quince. My guys don’t care for pumpkin/squash “as is”, so I’m always looking for creative ways to put it to use. Can I just use pumpkin pie spice that comes ready mixed? Sure, use whatever seasonings you like. I have 11 pumpkins im trying to figure out how to preserve and this looks like a fun option, tho I don’t have a dehydrator…. more ammo to use to try to convince Hubby that we NEED one…. I’ll try my oven. But my daughter is allergic to coconut. Is it necessary, or do you think I could just use chopped cranberries or raisins to help pull out the moisture and hold it together? It’s not a problem to leave out the coconut. It just adds a little extra sweetness and texture. Thank you for this recipe. I received a dehydrator for my birthday last summer and I regularly have winter squash on hand on the counter or pureed in the freezer (because I didn’t get around to eating it). I also make pumpkin butter on occasion but need better recipes for eating it regularly. I love acorn squash with nutmeg and a little butter right out of the microwave, which is usually a meal on its own. I also love butternut squash souffle, but only make it for special holidays. With the applesauce I already have that I home canned, I can make this for snacking (without the coconut) but with the coconut milk that I keep in my pantry. I’ll probably try some different seasonings too. I made this last night and just checked it and had some (half of it) and it is delicious! To be honest I doubted it would turn out as internet recipes are hit and miss, more miss than hit, plus I have a very simple cheap dehydrator and no experience with leathers. I had visions of scraping that sticky mess of my sheet but I oiled it lightly with coconut oil and it easily peeled off. Thank you so much for sharing this lovely recipe. I’m so glad it turned out well for you. Most of my recipes are pretty basic, and all the photos on the site are the actual recipes as made in my kitchen (no stock photos), but sometimes people still run into trouble. When my children were small I tried out a new recipe I found in a magazine. It looked quite unusual and I thought they’d get a kick out of it. The recipe was for “Stuffed Pumpkin”. Basically it was a meatloaf recipe you baked in a pumpkin. It was the most AWFUL tasting thing I’ve ever made. However, my fun and funny obsession with collecting pumpkin recipes was launched. Thank you so much for this one. I long ago stopped collecting pumpkin muffin recipes and almost anything sweet related, there are just so many. This unusual recipe is a great find and I thank you so much for sharing. I hope you enjoy the pumpkin leather much more than the meatloaf gone wrong. Oh my gosh, I have to try these making these! Unfortunately, I live in central FL and pumpkins/hard squash cannot grow. So, it will be canned pumpkin for me! Will let you know how they come out. Thank you for the recipe. Have you tried sprinkling with chopped pecans? I wonder if it would affect the pliability? I haven’t tried it. If you give it a go, just keep the nut bits small so they stick better and don’t interfere with drying.